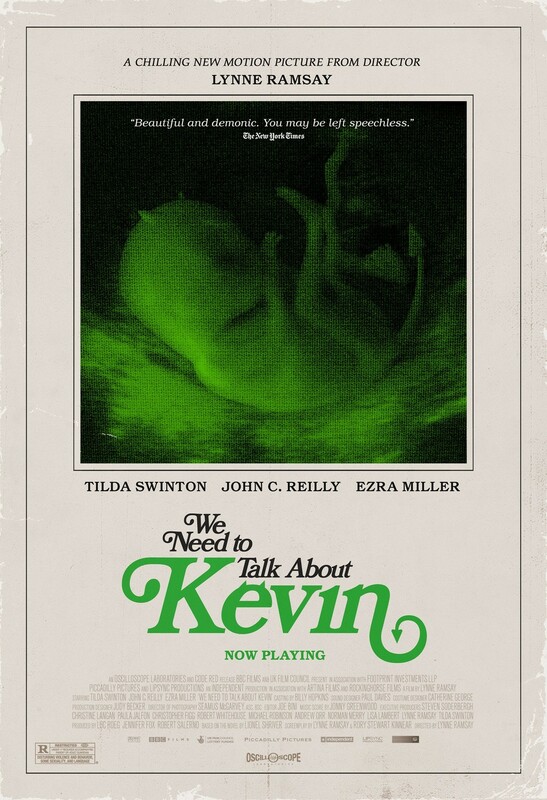 Today’s cinema adventure: We Need to Talk About Kevin, the disturbing and controversial 2011 feature based on Lionel Shriver’s award-winning 2003 novel of the same name. 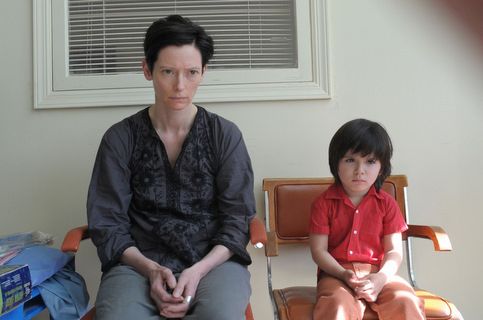 Tilda Swinton stars as Eva, a woman haunted by memories and repercussions as she attempts to come to terms with the horrific acts committed by her teenaged son. 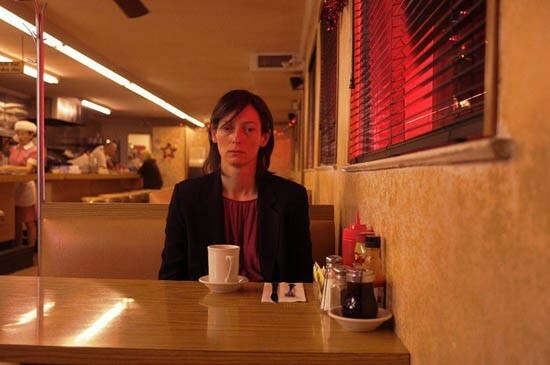 As directed by BAFTA-winner Lynne Ramsay, the film draws us in from its very first moments with arresting visuals and an enigmatic soundscape, unfolding its nightmarish story through a non-sequential progression of scenes and images that gradually piece together like the shattered fragments of Eva’s life. It’s riveting stuff: Ramsay (who also co-wrote the screenplay with husband Rory Kinnear) keeps us engaged and unsettled throughout, saturating us with stylish imagery marked by an ingenious use of color (with a decided emphasis on red, maintaining an ever-present suggestion of blood), layering in just enough foreshadowing and clues to conjure a growing sense of dread over the inevitable conclusion, infusing each scene with an atmosphere of resigned melancholy and foreboding, and dominating the proceedings with an uneasy silence which is only broken by spare, terse dialogue that shocks and pierces as much as it informs. As we observe Eva’s disjointed recollections and her nightmarishly surreal day-to-day life, we find ourselves drawn into her psyche; forced to face the uncomfortable- and unanswerable- questions raised about the culpability of a parent in the wrongs committed by their offspring; and in the end, the biggest question may be how to find a resolution, a sense of closure which can permit the lives of those left standing to go on- and if, indeed, such a thing is even possible. With all these psychological themes in play, one might be tempted to consider We Need to Talk About Kevin to be a complex drama, but make no mistake about it: this is unquestionably a horror film, the kind of nightmarish thriller that is rarely made these days. It follows no pre-molded formula, and there are none of the expected clichés of the genre: no sudden shocks, no scantily-clad female victims screaming as they flee through the dark night, no oceans of gore (for all the red flowing across our eyes, there is very little blood or violence onscreen, with Ramsay opting instead to paint the horrible pictures in our imagination where they are infinitely more disturbing). This is not some schlocky shocker designed for a teenagers’ date night, but rather, like other great adult horror films of the past such as The Exorcist or Rosemary’s Baby, it is an exploration of evil in our lives, of how it manifests and what might be its causes; but unlike the aforementioned classics, there is no suggestion here of supernatural forces- the responsibility is placed squarely on human shoulders, with implications that are far more chilling than the presence of any demonic scapegoat. 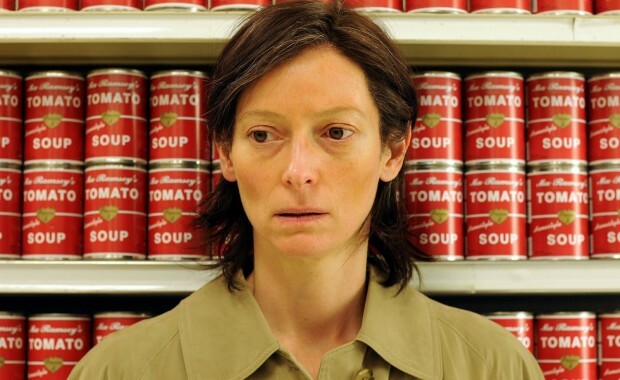 It would be easy, in the wrong hands, for Kevin to veer off into the realm of exploitative trash; but not only is Ramsay well-equipped for the task, she has the considerable benefit of Tilda Swinton in the central role. 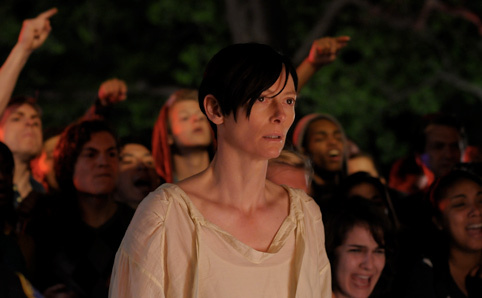 Swinton has proven many times that she is one of the most electrifying screen performers working today, and here she solidifies that reputation with a stunning, solid portrayal of a woman for whom the joy of motherhood has been inverted into a nightmare. With a minimum of dialogue, she conveys Eva’s harrowing journey with masterfully subtle changes in her continuous expression of dull shock, bringing home the frustration, the terror, and the loneliness created by the growing comprehension that her child is a monster and she alone can see it. 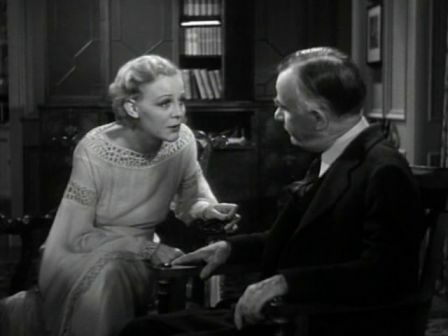 It’s a tour-de-force performance, and its failure to receive an Academy Award nomination for Best Actress- particularly when it was recognized by virtually every other major awards organization- was surely one of the great injustices of Oscar history. 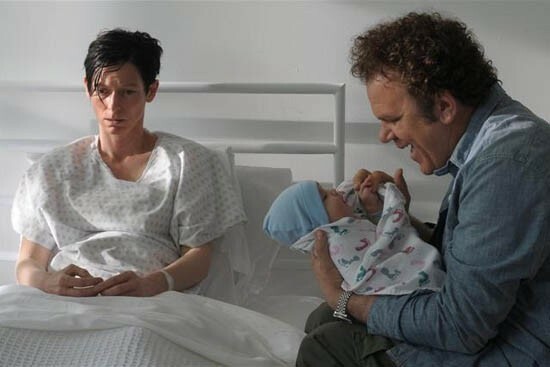 Supporting Swinton’s magnificence is John C. Reilly, likeable but obtuse as Eva’s husband, a man whose doting denial helps to enable the ever-escalating sociopathy of their son and drives an immovable wedge into their marriage; and a shining turn by Ezra Miller as the title character, who skillfully avoids the temptation of playing for sympathy- this is no misunderstood, angst-ridden adolescent, but a young cobra smugly and gleefully coiling up for a fatal strike. Mention is also deserved for Jasper Newell, as the six-to-eight year-old Kevin, who eerily projects a malicious menace beyond his years, somehow making the younger incarnation even more frightening than his future self. In addition to the stellar cast, Ramsay is aided in her vision by superb work from her technical collaborators: an eerie and atmospheric score by Johnny Greenwood (of Radiohead) meshes seamlessly with the carefully orchestrated sound design by Paul Davies; the cinematography by Seamus McGarvey provides some of the most vividly realized images in recent film memory, into which the simple-yet-striking costume design of Catherine George is brilliantly coordinated; and the editing by Joe Bini is a masterpiece of visual juggling, managing to maintain a steady flow throughout a narrative which freely jumps forward and back to multiple periods in time. 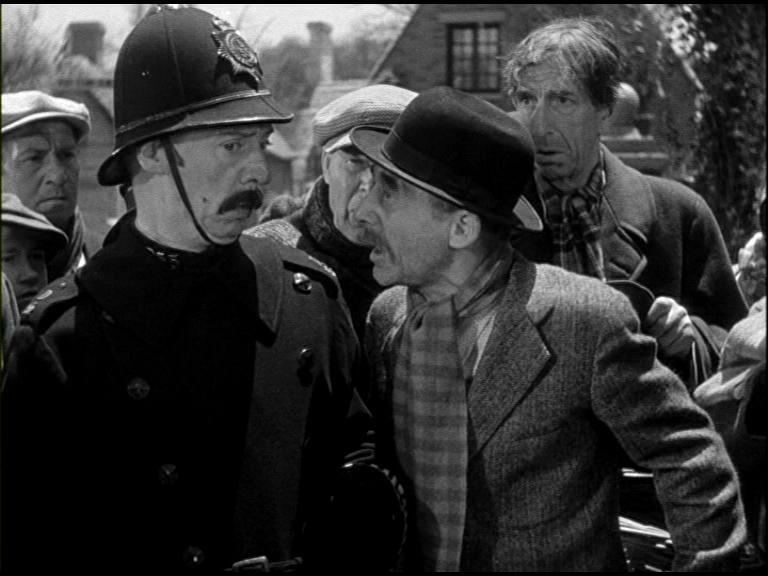 It is a shame- but not a surprise- that We Need to Talk About Kevin has yet to recoup the $7 million that was spent to make it; you can chalk it up as yet another sign that the contemporary film market is driven by an increasingly less sophisticated mindset, but this would be a difficult film to sell in any era, really. It is a psychological thriller that dares to address deeply disturbing issues which most of us would prefer to keep out of sight and out of mind, and watching it is a grim and unrelenting experience which may leave you disturbed for days afterward. If that sounds as good to you as it does to me, We Need to Talk About Kevin is a film you must not miss. 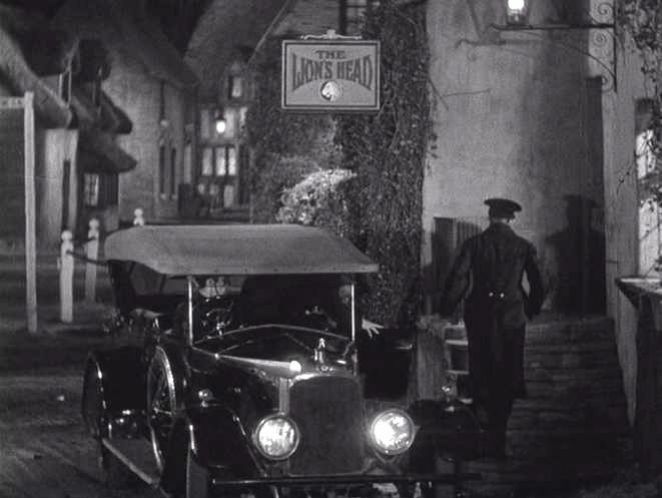 i liked this movie a lot. it was so disturbing and sad.